Jembatan Gantung Kota Intan or Jembatan Kota Intan or Kota Intan Bridge is a red bridge that spans over the Kali Besar (Great River). This bridge has a length of 38.6 meters with 4 meters wide and extends over along the Kali Besar 27.75 meters. 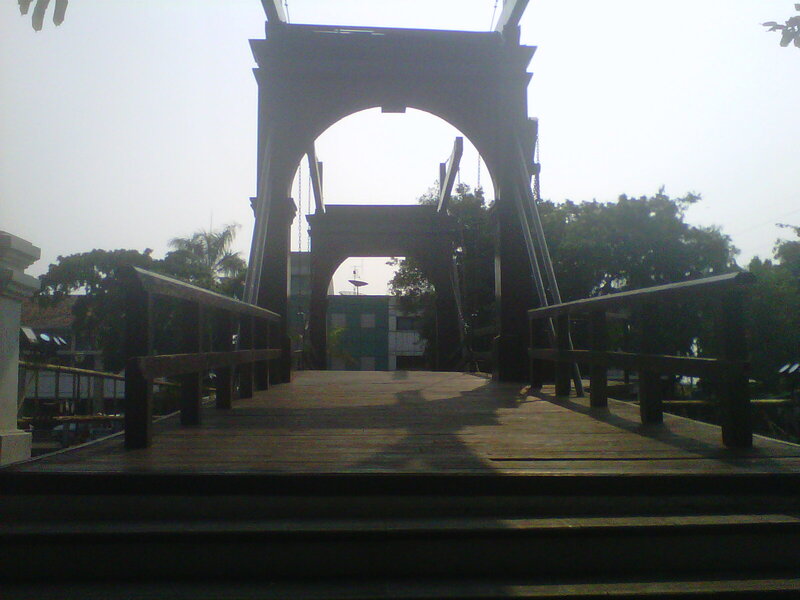 In the past, the Kali Besar is part of a network of canals that connects the port of Sunda Kelapa and the Old Batavia City, so the bridge is equipped with a lever to raise the bridge whenever any ship to pass. Jembatan Kota Intan was built in 1628 under the name Engelse Brug (British Bridge), this is because the bridge connecting the Dutch castle (VOC) and British castle (EIC) in which both castle were separated by the Kali Besar. In 1629, the bridge was damaged by an attack of Sultan Agung to Batavia, and 26 years later the bridge was repaired, and was named Het Middelpunt Brug or Center Bridge. But the more people know the bridge as Hoenderpasserbrug (Chicken Market Bridge), because in this place often buying and selling chickens. In 1938, the bridge was repaired and named Ophaalsburg Juliana (Queen Juliana Bridge). After independence, the bridge is officially named to Jembatan Kota Intan, because in this region once stood bastion (tower defense) were named Batavia Castle diamant (diamond). This Bastion was part of one of the 4 bastion of the Batavia Castle, each named diamant (diamond), robijn (ruby), de parel (pearl), and Safier (sapphire). Castle of Batavia at the time was the center of VOC trade activity in Asia, and became the forerunner Old Batavia City. Currently there are no longer remaining buildings of the castle, because it destroyed by the Governor General Daendels when moving the capital of government to Weltevreden (now the area around the National Monument) in 1808. The bridge is the only witness to the existence of the castle in the past.